Do i have to have my artwork when i establish my account? Why the 20% increase in on closing months? What is a display ad? Will my display ad be available online? How do i know if azbp is a good value? Why don't more businesses advertise in azbp? Does azbp reach more than the black community? Do you sell list or telemarket to your data base? Can i insert my information inside your publcation? Is there a cost to receive arizona's black pages? Is arizona's black pages the only black pages? Does azbp trade or barter for advertsing space? What is a "dbe" certification? No, there is still 30 days of production time for client artwork. However you need to establish your account prior to the close date. Your monetary commitment from your business, through a paid account, or installment account. This will allow you to process your artwork or listing information through production of the next directory. Installment accounts allow the businesses to manage cash flow more effectively. Our rates are held flat for 10 months of the year. Far too many clients wait till the very last minute to establish their account. To deliver the directory to the market on time, we must start production on time! At this point, we know who is going to be present and can commit to the amount of pages and ad locations throughout the book. Late players are requesting adjustments to the layout. This can be quite costly and pushes production timelines out further. The display ads are the highly communicative, digitally created images that communicate qualitative visual aspects of your business. If your budget allows it, design a display ad that represents your business image. Minimum ad rate $140.00, any size. It is the main piece of information the market uses to locate your business or services. Listings are simple text copy that informs information seeker of what products and services you provide, and where you choose to conduct business at. I.e. Valleywide or serving all arizona. Listings inform the community that you are "out for business." listings provide a minimum presence for your business in the african american community. Which will you select to have; no presence, or some presence? Use this gauge for any publication you are considering. Take the amount you are investing, and divide it by the number of copies. It will give your per head cost of reaching a potential customer. Then factor in the shelf life of your message? One day, one week, one month... Azbp is minimum one year. Average azbp shelf life is 18 months! Don't forget to consider the audience. Fact: contrary to popular opinions, everyone does not want to do business within the black community. Our strategy is to focus on the success of those clients that honor our community's value within this state. We offer over 5,500 businesses an opportunity to have a presence in the black community. Many say no, and those that say yes, simply ask you to patronize their business. These listed clients value your hard earned money and are easy to recognize, they're listed in the black pages. Yes, our books are proudly displayed in the sky harbor international airport terminals and over 72 distribution locations throughout az. Not to mention all borders book stores in az, along with countless motels and hotels that carries our books each year. Our internet presence has netted an average of 75 directory requests each month. No, we do not sell lists. We provide and develop marketing plans that include marketing to our data base. We do not provide any contact information to outside parties. We have the only data base of african american businesses and household in az. We currently have over 14,000+ contact files and increasing rapidly. Yes, insert your coupons for your products and services into 50,000 copies. Very reasonable rates at less than $00.05 per card! You may pick up a printed copy for free at one of the many distribution locations throughout arizona. Click on distribution locations for more info. 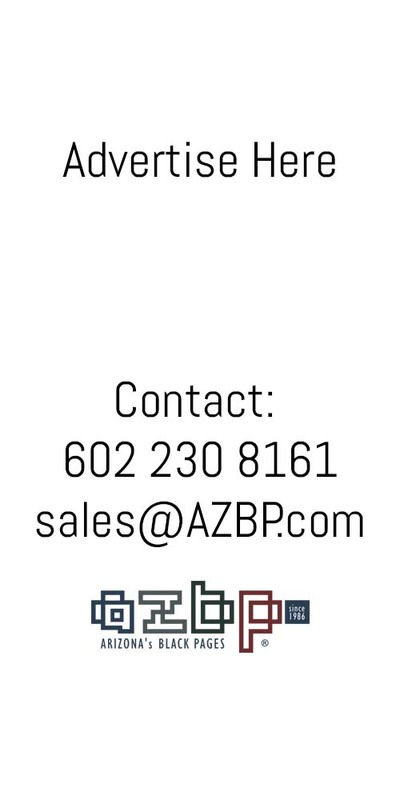 You may also subscribe to the printed version of arizona's black pages (azbp). You can receive azbp in the mail twice a year for only $10.00 per year (a $40 value). If you only want the current issue, send $6.00 shipping and handling fee. You may also pay by credit card by phone or download a subscription form. No, there are 60 black pages published nationally. There is no affiliation or conglomerate nationally, however there is a black page publisher's association that meets twice a year. Yes. There is a budget for such transactions, and they are kept to a minimal in order to grow the reach and effectiveness of the publication. If you care to submit a proposal for trade or barter, please request the corporate rate card as your cost reference. Many of our advertisers want business to business (b2b) type customers. In our effort to serve them, the corporate purchasing & procurement mangers have agreed to use the black pages, but need to know if the business is a certified disadvantaged business enterprise (dbe) or minority/women business enterprise (m/wbe)? You may obtain these certifications from your local municipalities, or the local chapter of the national minority council. It is just a qualifying statement to insure you are who you say you are; a minority owned and operated enterprise.